Lasers, Arudinos, cats doing funny things -- here's a student project custom built for the internet age. We popped by the Winter Show at NYU's ITP school to check out a new batch of works exploring the intersection between art and technology and couldn't help but be enamored by Cat Car, the "feline fitness frenzy." Designed to be a sort of exercise contraption for our furry friends, Sam Brenner's project eventually blossomed into something for more entertaining, though he assures us that "the safety and wellbeing of the cats involved [were his] top priorit[ies]." Cat Car uses a steering wheel controller with an attached Arduino and gyroscope / accelerometer, which communicate with a cat harness via an XBee. 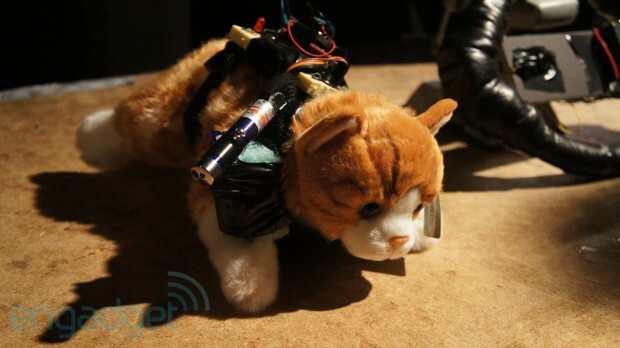 The movements control a servo on the back of the cat, which moves around a laser pointer, propelling the cat forward, thus allowing the user to remotely control the cat. A video of this magic can be found after the break.